They call Tibidabo the magic mountain and it is the highest peak in the Collserola range. From its summit you can enjoy the Temple Expiatori church, the amusement park, the observatory and, if it is a clear day, climbing up to the top of the mountain means finding the perfect spot for seeing as far as the island of Mallorca. A mountain you can climb by tram or funicular railway, that has been the setting for many public festivals and now asserts its role as one of the city's great hubs. At 512 m above sea level, Tibidabo is the highest point in the Collserola range. Today it is one of the places in the city's historical memory but it was not until the end of the 19th century that people of Barcelona discovered this mountain next to the city that opened the way to the green lung that is Collserola. Until then it had been a bandit's lair and pasture for goats. 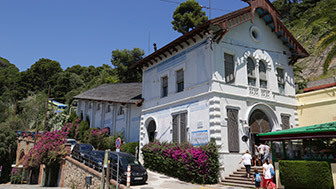 Plans to develop Avinguda del Tibidabo, with mansions and stately homes, also included building an amusement park and a church. So, in 1912, when the park was already up and running, the Temple Expiatori del Sagrat Cor was built, a Neo-Gothic style church reminiscent of the Sacré Coeur in Montmartre, Paris. The upper part of the church is 575 m above sea level and offers some of the best views of anywhere in Barcelona. On a clear day it is possible to see the peaks on the island of Mallorca. Such a high point proved ideal for building an astronomic observatory, the Observatori Fabra ,which is the fourth oldest in the world and still working. In the summer months, so you can feel a bit closer to the sky, the observatory organises thematic stargazing suppers. 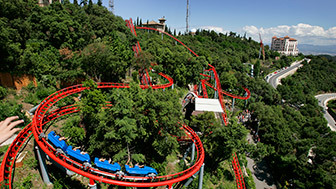 Another unmissable part of Tibidabo is the amusement park, one of the oldest in Europe and still going strong. It was built at the start of the 20th century and immediately became one of the favourite leisure haunts of Barcelona people. The house of mirrors, the unique views of the city from Talaia, L'Avió the plane from 1928, and the fairground machine museum, offer fun for young and old alike and form part of the city's memory. It has been a popular recreational site among locals ever since its opening in 1901. 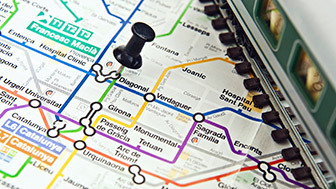 The Tibidabo funicular is a hundred-year-old train that connects the city to the mountain.